Yum! 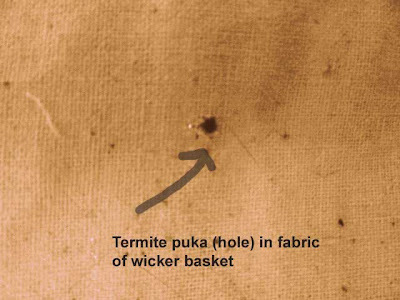 Wicker - the super food of termites on Maui. Not only will a termite chomp on wicker, it will happily chomp through the fabric covering any wicker. So, yes, just in case you were perplexed by one of those great questions while trying to fall asleep or mindlessly staring into space - yes, termites do eat fabric. Fabric is not their first choice, and not terribly nutritious for them, but to get to a bit of wicker, termites will chew away gladly. fabric covering my wicker basket. When I recently talked with the pest control folks, they said that one way to easily deal with small termite infested items is to put them in the freezer. Problem solved! If new termite holes reappear, throw it back in the freezer. Maybe I'll leave it there, like forever.